This new tutorial is suitable for beaders who have the basic knowledge of bead weaving, are familiar with attaching a stop bead and finishing off the thread, adding new thread etc. 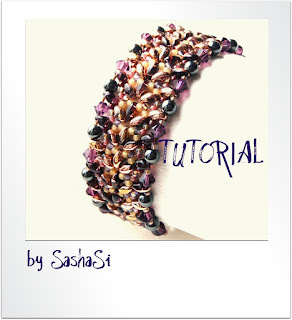 This tutorial is available for an immediate download. Super Duo two-hole beads, seed beads sizes 15°,and 11°, 4 mm beads- round and crystal bicones, a three-loop slide clasp, a few jump rings to attach it, needle and thread. the bracelet doesn´t take too long to make, why not experiment with colour combinations and embellishments?